"Keen on finding new talent" Collingwood coach Nathan Buckley spoke to the media ahead of the side's clash against Richmond in round 21. Holden has signed a multi-million dollar three year deal to become a premier partner of Collingwood and holder of the naming rights to the club’s world class headquarters at Olympic Park. "Keen on finding new talent"
Collingwood Football Club and Holden are both driven to succeed. Which is why the two organisations, who share iconic reputations for their passion, ambition and unmistakably rich Australian heritage, have chosen to strengthen their bond. Holden, Australia’s pre-eminent car company, has signed a multi-million dollar three year deal to become a Premier Partner of Collingwood and holder of the naming rights to the club’s world class headquarters at Olympic Park, now known as the Holden Centre. Holden will also remain the official sponsor of senior coach Nathan Buckley and his team of assistants, an association that dates back to 2013. This far reaching new commitment is timely. A magnificent $25 million addition to the Holden Centre complex will open in October, making available superb new public training and social facilities which will give the Holden Centre great scope for significant further community engagement. 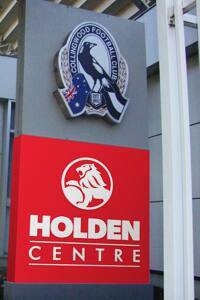 The Holden Centre, like Holden itself, is home to a high performance culture. Into the future, it is hoped that it will also be a meeting place for the sports minded of Melbourne. Collingwood President Eddie McGuire said: "When Holden and Collingwood united in 2013 we saw a natural fit and endless possibilities. Today, the alignment of Australia’s biggest and most famous sporting club with one of the nation’s biggest and most successful car companies continues to make us both very proud. "Collingwood and Holden Side by Side – you can’t get more Australian than that." Holden Executive Director of Marketing and Customer Experience Geraldine Davys said the newly named Holden Centre is a sign of Holden’s ongoing commitment to the Collingwood Football Club. "Both Holden and Collingwood are iconic Australian brands and we share great synergies from our rich Aussie culture, to the passion and loyalty of our fan base, to our commitment to innovation and excellence. "The Holden Centre is the perfect location to showcase this partnership and presents us with an exciting array of opportunities." Collingwood Chief Executive Gary Pert added: "It has been a pleasure to build such a strong relationship with Holden that, today, gets even stronger. The tradition behind our organisations is long and deep, and our proud ambition is mirrored by Holden’s. "Both are committed to being innovative industry leaders and each will help the other face the future with great confidence." In 2013, Holden re-entered the AFL football sponsorship market for the first time in 15 years by becoming a platinum partner and coach’s sponsor of Collingwood. The recent decision to significantly upgrade its investment in the club, Pert said, speaks of the vast potential in the relationship. "There is scarcely a more visible site in Melbourne than the Holden Centre, which sits at the heart of the world famous sports precinct known as Olympic Park. Holden got back into the game in 2013. Now they’re right at the heart of it," said Pert. "Across the road we play at the MCG to average home crowds of 55,000 and, most weeks, almost 1 million people watch Collingwood matches on television. This year we have signed almost 77,000 members, to be the best supported club in the land once again. "There are obvious synergies between Collingwood and Holden, one of the nation’s leading car companies, and we are proud that Holden has chosen to share our journey." Former naming rights partner, Westpac, will remain with Collingwood as a major sponsor and business banking partner. Please Note: Signage is waiting on final approvals from the Department of Planning.